Tango meets spaghetti western in this 9-piece ensemble, largely instrumental but with vocals from Elana Stone, Jane Sheldon and Mike Patton. Formed in 2005 and based in Sydney, Australia. Featuring soaring vocals by Elana Stone, this is a soundtrack-style piece driven by clavinet, strings and the twang of spaghetti western guitar. Recorded in Victoria, and backed with a rustic, beachy clip, ‘Holiday’ marks a coming together of two genres: Dunning’s laid back bossa/ surf jazz with Parker’s personal pop folk vibe. This waltzy, summertime song, a collaboration by Dunning and Parker, features soft organic vocals that both are known for. The song was born on the beaches of the Mornington Peninsula. ‘Holiday’ marks a coming together of two genres: Dunning’s laid back bossa / surf with Parker’s personal pop folk vibe. With a twinkle in his eye, he claims he’s not as old as Tony Bennett, but for fans of great easy-listening, you’ll enjoy Brian Bock just as much. A happy bouncy uptempo classic from Australia's very own Tony Bennett - Queensland crooner, Brian Bock. With her six piece “LA Combo” band, Burchmore takes the listener on a nostalgic saunter down the memory lane of Julie London. Better Than The Wizards are a happy go-lucky Melbourne based six piece that have been casting their blended pop, funk, jazz sound wands all over Melbourne’s iconic music scene. With a hint of the old school, latest single from Better Than The Wizards ‘Coming Back Your Way’ throws you back! Blues Brothers horn lines, gravelly vocals, all sexed up with a burnin' Hammond organ solo. In short, a bangin' pop tune that'll have you coming back their way. Hailing from a studied musical background, Susy Hull captains the mighty six piece to present listeners a kooky pop calypso. Hull draws noticeable inspirations from Fiona Apple, Regina Spektor. ‘Song Reader – Sydney Sessions’ is a compilation featuring some of NSW’s most critically acclaimed musicians. Each track is an interpretation of songs originally featured as sheet music on Beck’s ‘Song Reader’ album. Sydney based Indie/Folk/Rock, we are proud to be releasing our self titled first E.P! Its a bit fun, a bit melancholy, and occasionally spine tingling. We're excited. A folky amped up hoedown to get everyone tuned in sure to dance, sing and pour their hearts out with this fast paced anthem. Flap!’s virtuosity and lyrical sophistication draw the ear of the intelligent listener, whilst exuberant energy and hard-driving rhythms compel audiences to dance. The band effortlessly combines musical integrity and entertainment. 'NuStream' jazz trio featuring Peter Martin (guitar), Hamish Stuart (drums) and Brendan Clarke (bass). Mixing free improvisation with mainstream jazz elements (NuStream? ), the trio of guitar, drums, bass on this track display a strong undercurrent of energy whilst flickering above the "Fuego" (fire). Sophisticated, sensual and romantic, Nicola Milan’s blend of easy listening jazz combines the sultry cool of Melody Gardot with the elegance of Diana Krall. A dramatic and passionate tango that tells the story of a man haunted by the lingering memory of his lost love. His love’s memory is personified as her perfume which lingers tauntingly throughout his apartment. Sung with Nicola Milan’s sultry vocals, this magical track features a soaring violin solo. Sydney 3 piece that bring together incredible song writing, free jamming and great production. Inspired by Neil Young, Radiohead and Talk Talk. The Cat Empire's new album, 'Steal The Light', is out Friday 17th May on Two Shoes Records through Inertia. 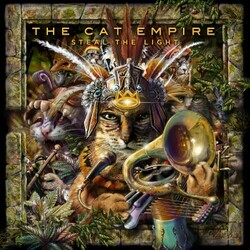 The title-track from The Cat Empire's forthcoming album, “Steal The Light”, follows the extraordinary success of lead single, “Brighter Than Gold”, which has dominated radio airwaves since February. Other tracks by The Cat Empire: Brighter Than Gold - Am I Wrong? The group bring you into their worlds through inventive improvisations and evocative soundscapes. Takadimi exerts a genuine obsession for the possibilities within genres and their indefinite boundaries. Bulgarian folk-style tune with an ancient line of Irish heritage, experimenting with being a Jazz musician on this particular night whilst drifting through the Blue Mountains and whispering 'Takadimi-takita, Takadimi-takita' quietly to itself. Shh. Listen. Alanna & Alicia are twin sisters who blend folk, jazz and roots in their original, acoustic songs. and are known for their sweet, sibling harmonies, fine songwriting, and impeccable charm. Taken from their recent release 'Twinlines' - twins Alanna and Alicia Egan display their infectious love of sweet harmonies and enchanting song writing on this track 'Fly Like A Bird'. joined by an impeccable band of musicians, the track brings about a nostalgia and emotive quality that is their own.